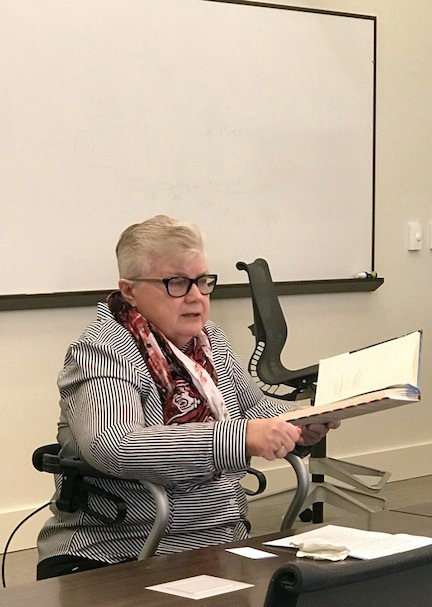 Yesterday Pretty drove Miss Daisy (moi) to the University of South Carolina Law School to speak to a joint meeting of the Carolina Equality Alliance, the school’s LGBTQ group, and the American Constitutional Law Society about Coming Out in the Workplace. This visit was our first opportunity to go inside the new Law School facility, and frankly, we were blown away by the sleek modern grandeur at the entrance and the high-tech classrooms lining the halls. Wow. Our tax dollars are working overtime, and the alumni’s donations must be, too. I am so thrilled to have such an impressive building on our campus. But while the Law School building is impressive, I was much more inspired by the students themselves. Most of the students were graduating in May and in the process of looking for positions, thinking about taking the bar exam in July, planning a wedding for the fall – all with equal levels of enthusiasm and anxiety. They had questions surrounding being out in the interview process, how to find employers that are welcoming, how to support friends in the role of straight ally…all very much about today and tomorrow in their lives. Yet, they listened intently to an old lesbian reading about events that took place 30 years ago as I began by raising Harlan Greene’s question in the foreword to Southern Perspectives: Isn’t the past passed? Perhaps. Or not. Since South Carolina mines the past and thinks of it as a natural resource of sorts, we (the LGBTQ community) need to be seen in that vein. And in that vein we looked at two women from the book who made a difference when they came out in the workplace. One of them, Deborah Hawkins, opened a lesbian bar here in Columbia in March, 1984. The bar was Traxx, and her heroic story of “making no ifs, ands, or buts” about the kind of bar it was when she opened it 34 years ago plus the challenges she faced with local authorities seemed to resonate with the listeners. To quote the infamous Red Man, all’s well that ends well. Pretty and I had an awesome time with these young people on the brink of embarking on their own history-making and I have great confidence that they will be a part of advancing the cause of equality in their careers – wherever they can – they will make a difference. P.S. I also wanted to thank Harriet Hancock, Alvin McEwen, Ed Madden, Bert Easter and Tom Summers for the excellent panel presentation we had last weekend at the Deckle Edge Literary Festival. It was such fun to be a part of the Festival and always a great time to spend with some of my contributors who are terrific motivational speakers. I am so lucky to work with pioneers who continue to believe in and actively support the cause of equality for all. This entry was posted in Lesbian Literary, Life, Personal, Reflections, Slice of Life, The Way Life Is and tagged american constitutional law society, carolina equality alliance, deckle edge literary festival, the university of south carolina law school. Bookmark the permalink. How wonderful that you got invited to speak. I wish I could’ve been there to hear you. I am positive all of those students will be better people for listening to you share your experiences with them. Thanks so much, Jenn…our history lives on. Reading that you were able to speak on campus is a hopeful sign when so many seem to accept only 1 point of view – either left or right. Yes, I think it’s hopeful. I’ve been with young people in several settings recently and have had my faith restored in the future! I needed it. You are really out there making a difference, Miss Daisy! Do you have an audio? Thanks mucho, Luanne! Miss Daisy has been busier in the first two months than she has for the past two years and no, I don’t have an audio…I’m not sure if Pretty is interested in anything beyond the occasional photos! !